Nuevo Peru: NewEpoch Media: VENEZUELA - Yankees go Home! SUPPORT THE PEOPLE OF VENEZUELA AGAINST THE INTERVENTION OF YANKEE IMPERIALISM THROUGH THE ONGOING COUP D’ETAT! US imperialism has never ceased to subject the Latin American countries to their interference, control, subversion and aggression just as Chairman Mao denounced in 1965, in his declaration against the invasion of Yankee imperialism to the Dominican Republic. On this occasion, just as we have been denouncing, the US Government, to accomplish its military intervention in Venezuela, has launched a military coup using lackeys and all kinds of mercenaries who, on Monday, have made a military mini-coup, which would be something ridiculous if it was not part of a whole plan of military intervention of Yankee imperialism, for which they have promoted the so-called president of the Legislative Assembly of Venezuela so that on January 9, before the inauguration of Maduro for his second term, the president of Venezuela would be considered illegitimate, alleging rigged elections, etc. The assembly has proclaimed Guaidó as president and in charge of the temporary presidency of the country. The same who has called a protest march for today, January 23, 2019, all orchestrated to prepare a provocation to the regime to give pretext to a direct military intervention by the US. Well, they are all only shameless pretexts of the maximum representatives of Yankee imperialism, Trump, Pence, etc. who has never ceased to subject the Latin American countries to its interference, control, subversion and aggression and that is the single hegemonic superpower in the world and the great counterrevolutionary gendarme that acts on its backyard along with all the reactionary governments of Latin America to suppress the struggle of the proletariat and the peoples of the oppressed nations of Latin America, to maintain the semi-colonial and semi-feudal situation, where a bureaucratic capitalism develops serving imperialism, principally Yankee, which is the principal imperialism that oppresses all our peoples. On January 10, in order to create favorable public opinion to its intervention, there were attacks on the Venezuelan embassy in Lima carried out by troops of worms and mercenaries of the country and some charmed masses, counting on the blind eye of the fascist, genocidal and motherland seller government of Viozcarra. Continuing with the preparations for the coup, the assembly appointed Gustavo Tarre Briceño as the country's special ambassador for the Organization of American States (OAS). As affirmed Guaidó, the decision answers to coordinate he necessary actions for the restoration of constitutional order with the OAS t.
Last Monday 20, a group of the Bolivarian National Guard (GNB) took a police station and seized weapons, calling to ignore the newly appointed leader, then the insurgent group surrendered and was captured after agreeing to surrender to soldiers loyal to Maduro. However, the episode reportedly gave a new reason for the intervention of the United States in Venezuelan internal politics. Thus, Vice President Mike Pence published a video yesterday in which he describes Maduro as a dictator and leaves a message to the opposition: "While they make their voices heard tomorrow (for today), in the name of the American people we say to the good people of Venezuela: We are with you ", encourages Pence in the video. The vice president also reiterated that the opposing National Assembly (AN) is the last vestige of democracy and once again expressed its support for the leader of the legislative chamber and self-proclaimed president Juan Guaidó. The vice-president of Venezuela, Delcy Rodríguez, denounced this as being an instigation to a coup d'etat. "Today the vice president of the United States, Mike Pence, has manifested, openly calling for a coup in Venezuela. We are not going to allow them to interfere in our affairs", said Rodriguez in an speech that was broadcast on VTV state television. She added: "The fascists of Venezuela who obey the orders of Mike Pence, what Mike Pence gives them is not a recommendation, it is an order and not any order. He gives them the order to burn, he gives them the order to kill, he orders them to perpetuate acts of false positives on January 23", she told reporters. Adding that false positives, "false military officers would eventually fire on the opposition demonstration today, for what? To fulfil the orders of Mike Pence." Their lackeys, from the Forum of Davos, as the presidents of Paraguay, Costa Rica and Ecuador demanded an urgent and joint solution to the political crisis. "I do not believe in military interventionism, but in those interventionisms in which one appeals to respect the human rights of citizens," said the president of Ecuador, Lenin Moreno, during a debate on Latin American affairs. "The solution is to solve it among everyone", Moreno emphasized and coincided with the rest of the countries, which have political differences with Venezuela, that the Central American country is experiencing a dramatic situation. Political differences that were radicalized with the second investiture of Maduro where, for example, Paraguay took the opportunity to break diplomatic relations. Already last night there were protests and cacerolazos [protesting by making noise with pots] in Caracas, which ended with the death of a 16 year old teenager after he was shot. "We condemn the murder of young Alixon Pizani for gunshot wounds during a demonstration in Catia, Caracas," said the non-governmental organization Observatorio Venezolano de Conflictividad Social (OVCS). As if reproducing what was done by the Yankees in Iraq, in San Felix, in the Bolivar state of Amazonia, demonstrators burned a statue that remembered the late President Hugo Chávez and that had been raised by the government in the middle of last year, according to the Caracas newspaper – El Nacional. Local media - which reproduced videos published by citizens on social networks - claimed that police troops repressed several of the protests by using tear gas and hydrant cars. In previous days, the leader of the "gusana" opposition declared to The New York Times: "The Venezuelan's relationship with the State today is one of terror," Guaidó said in an interview. "When that happens, the voices and lights of the world, those messages, are even encouragement for the daily struggle and to resist and dream of democracy, with a better country." "Several officials from other countries, particularly the United States (who wants a transitional government in Venezuela), say they see a refreshing leader of humble origins in Guaidó that contrasts with other opposition leaders in the past. those that Maduro disqualified when calling them oligarchs or extremists of the extreme right. US Vice President Mike Pence directly addressed to Venezuelans in a video posted on January 22 on Twitter that says Maduro is "a dictator with no legitimate right to power" and says that Americans: "We are with you! We support you and will continue to support you until democracy in Venezuela is restored. " The political opposition has taken advantage of these demonstrations of support to encourage people to go out to protest on Wednesday. Faced with the scheduled date for the protests, the opposition leaders said they were feeling hopeful because of the crowds that have already attended rallies and town meetings, as well as some street demonstrations during this week. They believe that there can be a turning point if there are high-level defections among the military that have helped Maduro to stay in power "(The NYT, January 23, 2019, Many in Venezuela celebrate the arrival of Guaidó because it gives him a new face to the opposition, Credit Manaure Quintero / Reuters) ". As Chairman Mao denounced, US imperialism has never ceased to subject the Latin American countries to their interference, control, subversion and aggression. 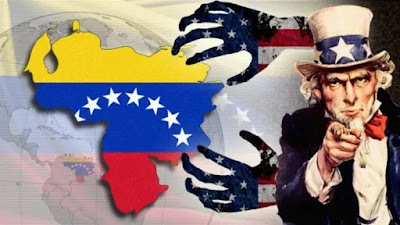 On this occasion, the US Government it has abandoned all deceptive phrases such as "the policy of good neighborliness" and "the principle of non-intervention", and an aggression and intervention manifested in the Bolivarian Republic of Venezuela is been carried out. This has shown even more the true features of the American imperialist gangsters. The United States is carrying out the preparation of its armed intervention against the Venezuelan people under the pretext of "defending freedom". What kind of "freedom" is this? It is the freedom to use airplanes, warships and rifles to massacre the peoples of other countries. It is the freedom to seize the territory of other countries at will, the freedom to crush under their feet their sovereignty to its will. It is the freedom of the pirates to plunder and kill. It is the freedom to trample every country and every town under its heel. This is what the US imperialists are doing now in Venezuela as they are doing in the Expanded Middle East, as they have done before in the Dominican Republic, in Vietnam, in Congo (Leopoldville) and in many other places. As Chairman Mao and Chairman Gonzalo teach us, this is forcibly posed to the Venezuelan people and to all the peoples of Latin America that, in order to safeguard national independence and national sovereignty, it is imperative to carry out a "blow after blow" fight against the aggressive Northamerican imperialism and that the proletariat needs to reconstitute its Communist Party, the heroic combatant who leads the People's War to put an end to imperialism, semi-feudalism and bureaucratic capitalism. We tell the heroic Venezuelan people that, without a doubt, you are not alone in your struggle. You enjoy the support of all the peoples of Latin America and the world, it is up to you to engage in a powerful armed struggle to resist and combat the aggression of Yankee imperialism and all its lackeys in the country and abroad. It is up to the Maoists to push forward a new wave against Northamerican imperialism among the peoples of Latin America and the world. 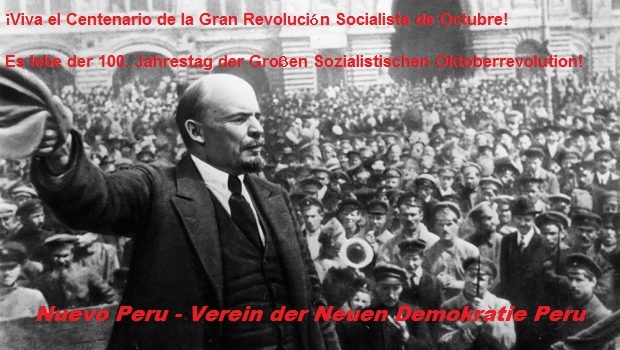 The struggle of the peoples of the world against Northameriacan imperialism will win! Northamerican imperialism, common enemy of the peoples of the world, will fail!